For people that dont read error messages or readme.txt, demo requires cubemaps and DOT3, or to be clear, GForce+ or similar. TNT wont work. Needs quite a bit of fillrate (we went a bit far in some of the particle scenes), CPU isnt so important. Very acceptable perf in a P2-400 / GF2. We got reports about not performing well in some GF2's will check it out soon. GF2Go/MX: Sluggish in some transitions. Enjoy the prod. threepixels is off to ibiza now!!!! :P. We will release a divx of this prod when we're back. some of the effects looked quite impressive, but you gotta work on your colourscheme and the music. improve: some textures look a bit too simple, same goes for font. One of the best demos for 2oo2. Fast paced with nice trance music, colors that fulfill the eye, great effects... More than solid. Flawless. Runs kinda slow on my GF2Ti, but that's one demo worth making an upgrade for. take the code from this demo and the colours from tpb-03 and some more prof. sounding music and you'd have a cool demo. music could've used some more work, and the textures/font probably too, but all in all it feels quite good. oh, and one thing: you should definitely improve your choreography, animation and camerawork. all those scenes look a lot better on screenshots than they did in motion - which is a bad sign. - Music is so forgettable it actually detracts from the demo. - ryg's dead on with the motion thing. Looks promising, but no Geforce card here. Cool prod. Could have used a better track though. deffo 1 of the nicest looking demo's I've seen, although not quite perfect,it still rox!! Nice One. Just slowed down on last scenes on my p2/450+geforce256. I think those metaballs was lovely..
cool. quite slow at few points (the music starts screeching and fps drops). also, I'd agree with the point about camerawork & scene layout. all in all, it kinda lacks something to be really trippy, but it's still nice. Rules a lot, not the type of demo that I expected, but it looks nice, and the fx are impressive. Might be Dutch style but in my opinion it's far better than any Dutch production I've seen in the last few years. pretty mediocre actually. apart from the fact that some effects use dot3-bumpmapping there's not a whole lot going on here that hasn't been done to death already. a bit long.. but great! Anyway really nice visuals, and good effects. DOT3 bump put to good use! "bueno.. esos colores de coder... "
coder texture generator? :p ;) ... anyway few points of diferente between stravaganza demo with 3px prod, but results were good. i could just say it's not "unforgettable", but let's try argumenting.. Excellent excellent excellent. Although it runs a little slow on my GeForce2 MX. The only thing that bothered me was the vocal sample in the music. No plot, no story, *just* a showoff of imposible tricks espectacular scenes and sincro. The metaballs scene looks like too much clean,(and using a Bryce render as Cenv-map?¿) everything else, is great, and contains some of the best geometry tricks ever seen, since Poem to a Horse. Pump up volume, view the prod, and stare, then ask yourself if any other group, nowadays can make a more cutting-edge-impressive stuff, or even yourself can? Dare! Very nice. The middle part is just a little too reminiscent of 604. And a bit slow on a Tbird 1.4 with GeForce 2, in 640x480 with all the features. But I can live with it. phoenix: it's a tribute, just as the bmapped twister (gateways/trauma). What is all the features? Usually I like this kind of demos, but in this case it's just average. Don't ask me what's wrong with it - just personal feelings. Some impressing scenes here. I particulary love the transition using that cube thing with glow and the scene featuring stencil shadows. The bump mapped twister looks very cool too (and they succeeded sooo well on matching trauma's one ;) ). Also radial blur and dot3 are not used cheaply. On the bad side, I see some abuse of particles and some textures/camera movements/music parts are not at the overall quality of this demo. Oh, and no one told about the code, and IMO its one of the best code shows seen this year. Should have won the compo, definetly. the cube in cube shadowed effect is very good! Too flashy! :/// Too much andy colours. Very nice, always popular at parties. seems to run like poo on my 9700. Needs 3da to stop stuttering, plus end twister and scene 4 run at 1fps. Putting any ATI probs aside, excellent! Great Music! Nice. In few parts, in random PCs, it suddenly went too slow, bug or something? Finally I could watch it now, great demo! For me clearly the best 3px demo so far. crest: with the same machine? Wow, this is a really great demo =) I enjoyed the music, and the visuals are quite impressive. Great job threepixels! I like it even though I'm normally against drugs, imagine that. anyway, resembling to 604 is good, having so much glitches is bad. Beautiful but maybe could have had some more energy. Some sort of beefed up "please the cookie thing", entertaining nonetheless. The colors are kinda ugly, and the music isn't the best as well. But the code is alright, and in 2002 it was a good demo. Totally forgettable. Textbook demoscene effect after effect after effect. The colors are about the only thing original here. Great demo. But totally uninteresting. Fun demo with great goa/psy vibes. A very fine demo ! Not usually something I enjoy, but surprisingly well made psychedelia. Well done on most of the palettes, in making them very bright and saturated, but not garish. Pretty cool! 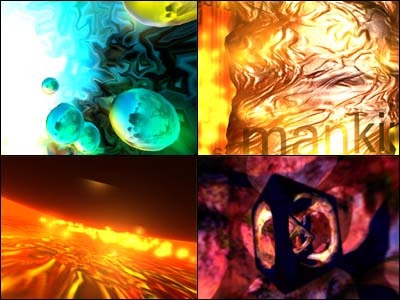 Apparently this has been part of a Demoscene Demo Reel at GDC 2003.
page created in 0.023246 seconds with 15 queries.